On Friday 21st I went down to Abbey Road studios today to firstly meet up with my friend and one of the very best record producers in the world, Andy Wright. ‘Shock Horror’ my wife Lyn actually decided to go with me. What a surprise that was for me! Anyway, we arrived and parked the car at the front of the studio. It’s always interesting when I go to Abbey Road Studios. The crossing must be one of the busiest in the world. There are always loads of people crossing and stopping for a quick photo ‘Beatle Style’. There are also quite a lot of people taking photos of anyone arriving and parking in the spaces at the front of the studio. Lyn and I went inside, signed in and headed straight to Studio 1. Andy Wright was starting a media TV interview. Lyn and I waited outside of the control room as requested by the media company who were filming him. So, whilst this was going on, I showed Lyn around the place. Studio 2 was open and no band in there. So, in we went and I showed Lyn where the Beatles recorded their classic albums. So, many other stunning bands have recorded historic albums there as well. Actually not only in Studio 2, but also studio 1. Actually, what am i talking about? The whole of Abbey Road and all studios and mixing rooms etc have pretty much produced amazing music over the years. Here is Lyn in Studio 2. As soon as Andy had finished, he, Lyn and I went into the famous canteen and had lunch. Whilst we were sitting there, Giles Martin (Son of Sir George Martin) popped over to say hello to Andy. He seemed very nice. After lunch, we headed back to Studio 1. Where we met up with the lovely people from the record label & Nile and his manager, Merck. I first met Merck when he was with Sanctuary Records and that must be around 2002 ish.. However, Nile and I have known each other since 1980 when we both went to a Studio 54 party in New York. Nile, Diana Ross, Gene Simmons, Paul Stanley, Keith Richards, me and many others. That was also the night when I photographed the one and only Chuck Berry, who was performing at the club. I introduced Lyn to Nile as we reminisced about that night in 1980.. Mind you, we didn’t chat about that for long, as we had work to do. Nile is actually working on a track on the album that Andy Wright is producing. I can’t say too much about it, but, let’s just say that there quite a few major artists on it and Andy has done an incredible job on it. He really is an amazing producer. Anyway, Nile knew what he had to do and he got on with it. I did take some nice shots of Nile and some of the musicians who were on that session. Here is one of Nile for now. 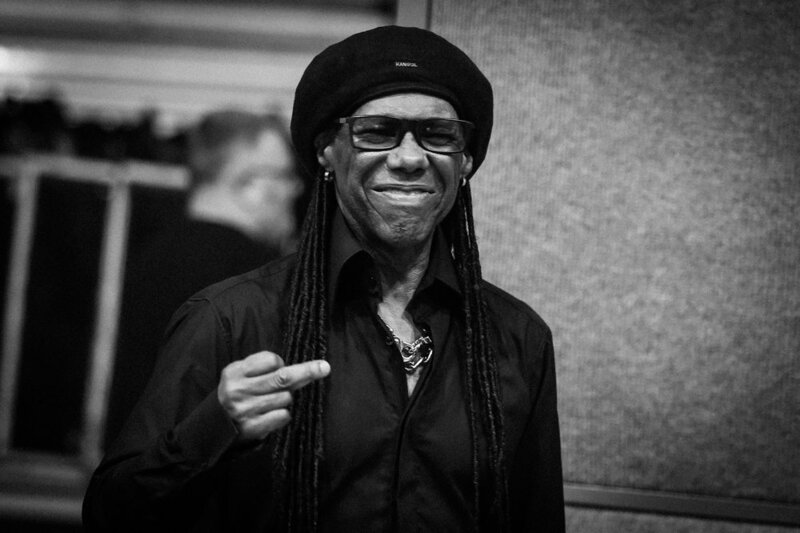 The classic ‘One Sugar Please’ shot..
Nile Rodgers Apparently counting in the musicians! I have lots more, but, they need to be held back for the record label, so they can choose what they want for the album.